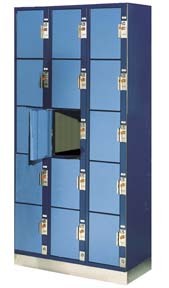 These Hanging Locker are available on www.buyusedlockers.com where they have a huge selection to choose from if we need additional supplies. These four-person wall mount lockers are in great , nearly new condition and are a great solution for home or work. Put these in your employee break room, warehouse, or at home in your shed, garage or laundry room for all your storage needs. Each door can be locked with a padlock to help keep thing safe and secure. These lockers ship assembled and ready to use.